Nudie Juice is taking on the soft drink category with its new 50% fruit juice Nudie & Soda range for customers fed up with getting a ‘bad deal’ from existing brands. Nudie Juice marketing manager Carlie Platts says the company was driven to create Nudie & Soda, the first soft drink of its kind in Australia, to add some goodness into the soft drink category. “We have always aimed to create good in the juice category and more recently we have explored other categories where we feel the customer is getting a bad deal, soft drinks being one of them. Nudie & Soda is made with 50% real fruit (not from concentrate), 47.5% carbonated water and less than 2.5% added sugar. It contains no added ‘nasties’ such as preservatives, concentrates, colours or flavours. apple, cucumber & kiwifruit (330mL only). A key insight that drove the new product development was the finding that despite 86% of Australians consuming soft drinks, 75% say they feel guilty about it. “The main reasons people are feeling guilty about drinking soft drinks is because of added sugar, preservatives, colours, artificial flavours and the belief that they don’t add any nutritional value to their diet,” Platts says. Australians consume 1.3 billion litres of soft drink each year, and the category is growing slowly at 1.1%. Platts hopes the new products will appeal to current Nudie customers looking for a healthier soft drink alternative, as well as people who may have stopped consuming soft drinks due to unnatural, unhealthy ingredients in other brands. 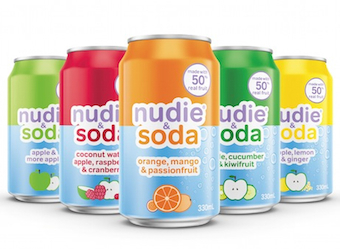 Nudie & Soda is currently in Coles, select IGAs, Thomas Dux, Harris Farms and select cafes and convenience stores. “We want to get Nudie & Soda ranged in as many stores as possible. So far, the feedback we have had on the product has been overwhelmingly positive,” Platts says. 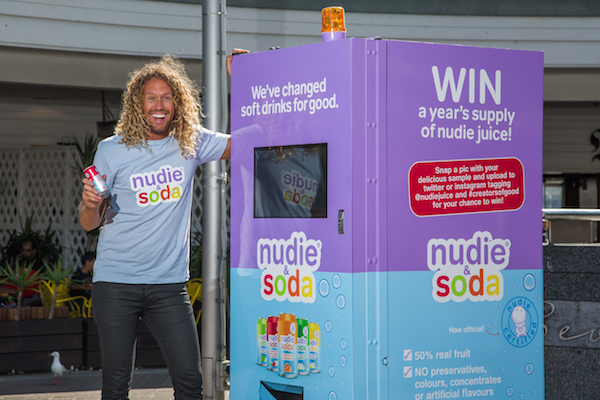 The company launched the Nudie & Soda product with an amusing campaign featuring a vending machine ‘with a twist’. Bringing to life the product’s point of difference (made with 50% real fruit), people were invited to challenge the vending machine with a series of quirky 50/50 questions. If they answered at least two questions correctly they received a free can of Nudie & Soda. 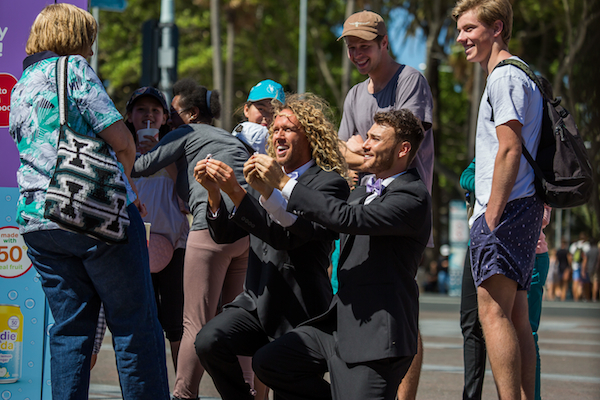 Big Brother 2013 winner and Nudie brand ambassador Tim Dormer surprised the public in an amusing series of incidents, all filmed with six hidden cameras. 48 proposals (42 yeses and two run away honeymoons).